One of the basic necessities for motorcycle safety is a good pair of motorcycle boots. 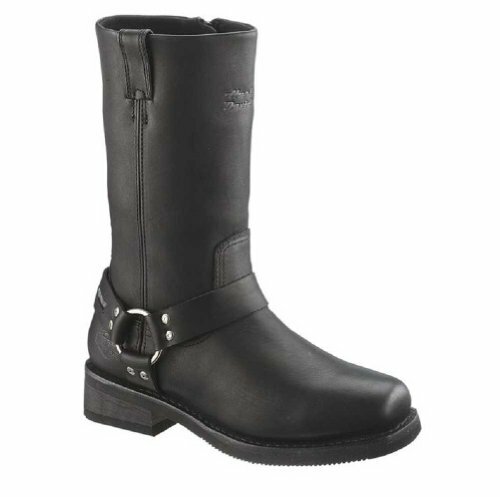 Mens Waterproof Motorcycle Boots or biker performance footwear come in a number of styles made for each riders personal style. I have ridden my bike through innumerable rainstorms. I have had wet, soggy feet and boots that didn't dry out for weeks. I eventually found some amazing waterproof boots that have lasted me for years. Style, safety, performance, fitment, durability and comfort are all things to consider when looking to purchase a motorcycle boot. No matter what brand or style of bike you ride, there are boots for you. Comfort - I need to be able to walk for miles and ride for hours in comfort. 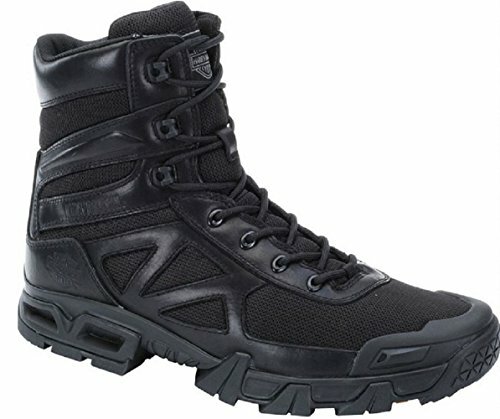 So my ideal boot needs to be ergonomically correct when I am riding and still built so that I could go for a long hike if I wanted to. Few things are worse than blistered, raw feet. Breathable linings or footbeds in boots also add to comfort and are removable for washing. Good item for those with foot odor issues. Good soles with traction - Some folks need thicker soles if they have shorter legs. Regardless of height, the importance of keeping a good grip to the pavement, gravel, or grass when you are holding your bike up is immeasurable. Riding boot soles also need to be oil resistant. A harder sole will last longer, but a softer sole will give you better grip on the footpegs. Materials for soles are varied, from leather to Vibram and other anti torsion man made materials. Good fit - Are your calves large? Do you have wide feet? Perhaps you have very narrow feet? Most of us have at least one issue in fitment for boots. For people that have calf size problems, a possible solution is a zip up boot with adjustable laces, or a shorter boot style. Many companies are now fitting for wider feet. An ill-fitting boot can lead to pain and circulation issues. Durability - I consider motorcycle waterproof boots to be an investment. They are sometimes more expensive than your average footwear purchase. So, in my world, they need to last. Seams should be double or triple stitched to make sure they stay together. Soles should not be just glued. Stitching as well as gluing soles them to last longer and be safer. Style - What is your style? Old school, new-age, buckle, zip up, buckle closures are some of the choices. Your materials can be leather or textile. Also, the type of biking you do makes a difference in the style of Mens Waterproof Motorcycle Boots you choose. Do you want built in armor? Whats your color choices? The selection is amazing. Whatever your style, its out there. Safety - I think most of us can agree that riding in your basic running shoes is not really a very safe practice. An unprotected ankle will be one of the first things to hit the pavement in the event of a crash. Modern day boots can come with every degree of safety precautions that could possibly be put in a boot. There is built in armor that comes in Kevlar, plastic or carbon and is placed in high impact areas of the boot. Steel toes perhaps? This is an option that protects your feet, and has been scientifically proven not to cause injury as myth would have had us believe. 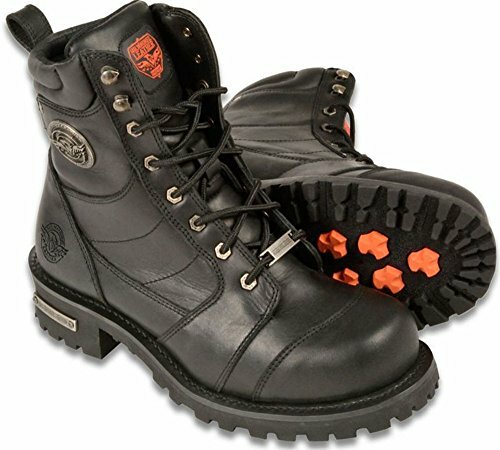 These Harness boots are rated and reviewed highly. Some owners of these Mens Waterproof Motorcycle Boots have had soles replaced a few times, but have had the same pair of boots for years, so this means they are durable. Consensus is that these beauties are both good looking and comfortable. 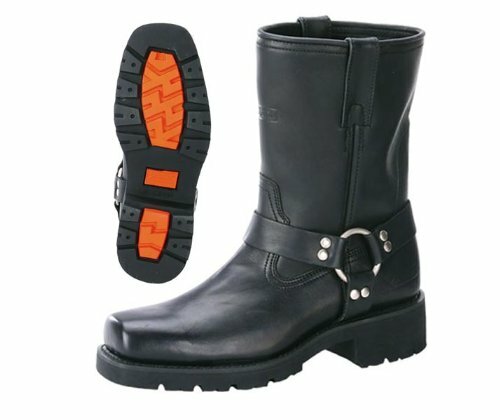 Bikers are loving the side zipper addition to this style of boot. They fit a little small, so keep this in mind if ordering. Most reviewers say to order 1/2 size larger. Break-in times are varied, but walking and riding are reported to be a breeze once they form to your feet. If you have really wide feet, these may not be your best choice. The TCX X-Blend Motorcycle Boot is a Waterproof Lace up type boot that is another example of rugged, masculine, tough guy charm. Not only is this mens footwear complete with a waterproof lining, the upper part of the boot is full grain vintage leather. The soles are wear-resistant rubber. The footbed is anatomic and replacement liners can be purchased [a good cure for odorous boots]. They come in color choices of brown or black. There are so many features that I like about this boot. They are CE approved and have ankle, toe and heel protection. Reports are that the leather is stiff and may take a little while to break in, but not too long. Once the break in period is over, these Performance Footwear classics are flexible and comfortable for riding and walking. The breathable, waterproof lining goes to the top of the boot to keep the whole boot dry. For motorcyclists that have short legs, the thicker sole may make reach to the ground an easier thing to do. Sizing notes say that these boots are pretty true to size and width is average. The Tourmaster Response WP 2.0 Road Boots are an above the ankle style, with 100% polyester round laces plus an adjustable Velcro strap for easy fastening. They have a leather shift pad for a more modern look. Foot comfort is ensured with a preformed orthopedic vibration absorbing foot bed. A non slip sole is provided for your safety. A waterproof, breathable membrane inside the boots assists in keeping you dry. These black beauties will for sure make a statement. These casual 'shoe' inspired boots provide style and comfort. They are a tie up style with a velcro keeper. There have been some reported issue of the velcro fraying the boot lace. But all in all I think this is a minor complaint or issue. Carry and extra pair of laces if you are worried. Vibration discomfort is pretty much eliminated by the absorbing foot bed. 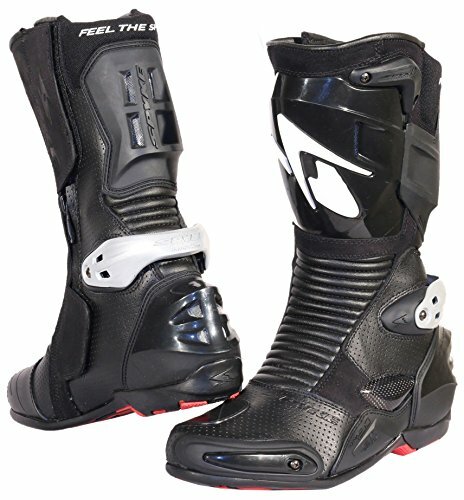 These boots also have a thermoplastic ankle cup and toe cup that are stylishly hidden from view and add to the safety of this motorcycle boot. Comfortable is the one word that keeps repeating itself in all the reports and reviews that I have read. These are an economical choice, so they wont last as long as more expensive brands. Life span is a reported average of 3 years. They are reported to be very waterproof. The VR single density compound sole provides a reliable grip. 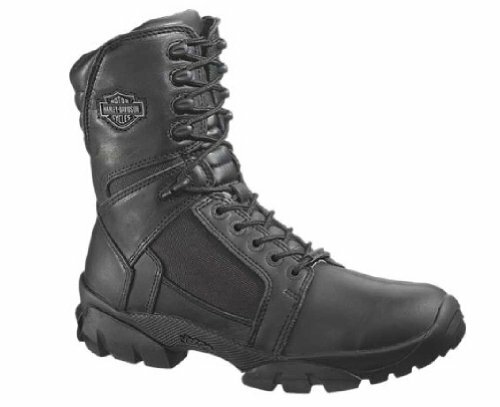 The Harley-Davidson Men’s Allen Waterproof 6-Inch Black Lace Boots. These are the ‘sneaker’ version of a waterproof motorcycle boot. They are made with the best waterproof full grain leather and mesh uppers, breathable ventilation to allow air flow, and with a full-length soft cushioned sock lining for comfort. Rubber outsoles provide traction, comfort and performance for hours of carefree wear. These boots portray a laid back and carefree look. I have read nothing but rave reviews for these boots. 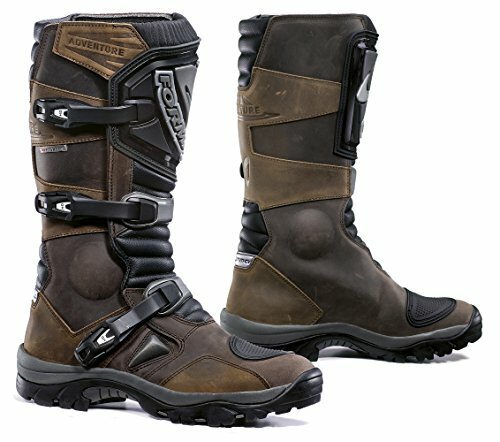 They are truly Mens Waterproof Motorcycle Boots winners. These are purported to be just like wearing your most comfortable pair of running shoes. Both lightweight and stylish, they fit comfortably and require no break in time. A pair of these will fit a little large, but still not for really wide feet. 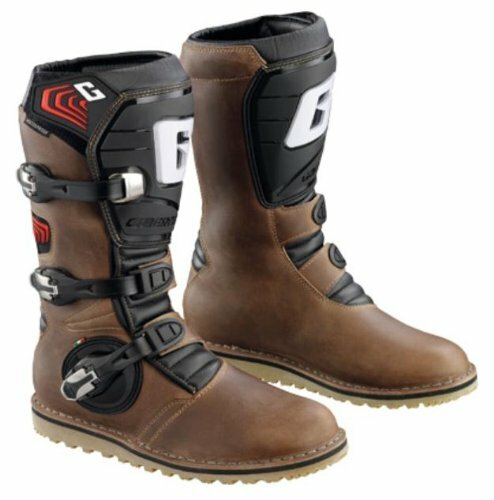 The Alpinestars SMX-6 Waterproof Men's Motorcycle Street Boots Provide a waterproof style for the younger generation of bikers. These trend setters are anatomically profiled and packed with innovative features. 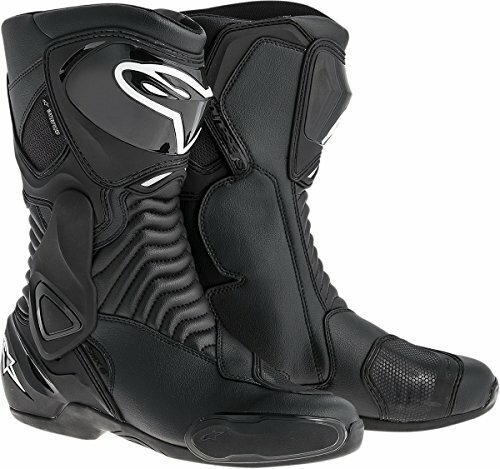 They incorporate the latest advancements in Alpinestars' performance footwear design and development. Every component on this CE certified boot has been carefully designed to give you a crucial performance edge or keep you in the seat for longer, in the form of protection innovations, improved ergonomics and comfort features. 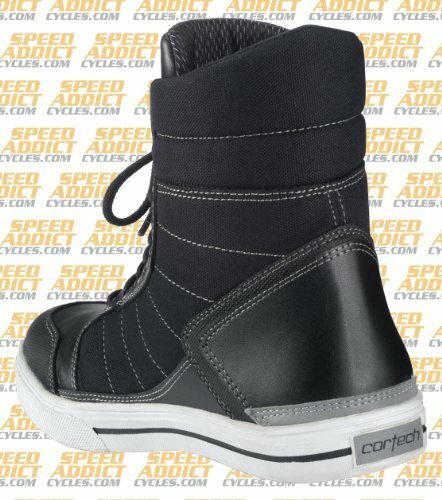 For my biker buddies with the wide feet, these boots may be your answer. Advice is to get them a 1/2 size bigger than what you wear with street shoes. 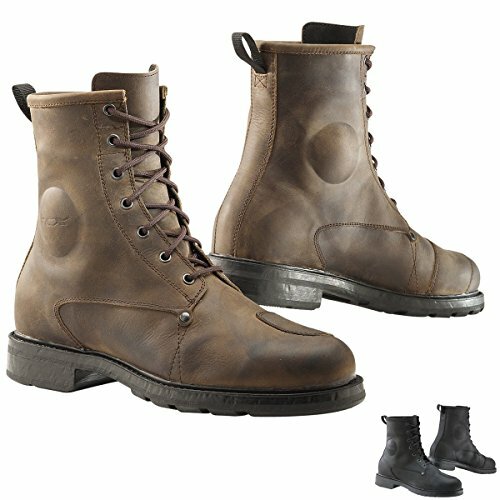 There are many safety features to this pair of performance boots including a compound rubber sole for grip. Comfort is one of the biggest positives as is the waterproofing. The main upper material is an advanced microfiber material. This boot is supposed to not get as hot as the full leather styles. 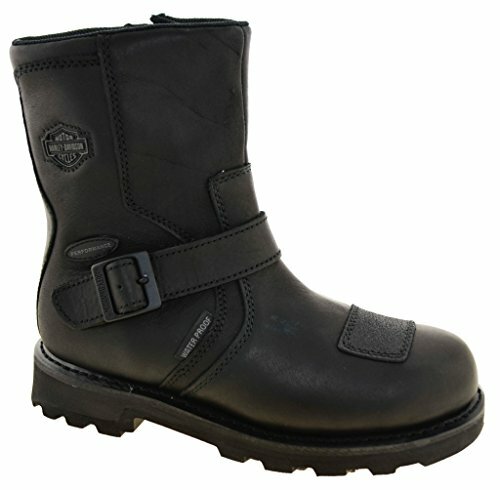 This boot zips up for convenience and the velcro strap is adjustable to comfortably envelop the calves. If you have a little larger calf, this may be a great boot for you. 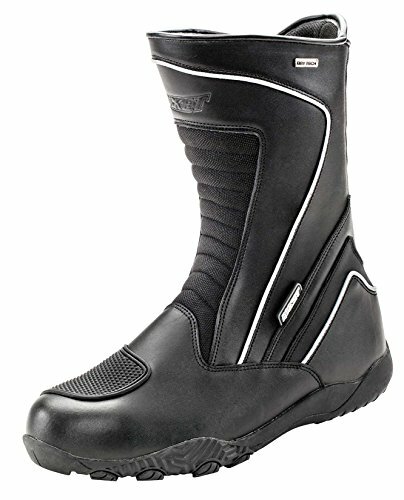 The following is a smattering of other Mens Waterproof Motorcycle Boots for your perusal. Each has its own individual highlight features. There are so many choices out there that I cant review them all, so tried to get a sample of several brands and varieties. I hope you enjoy looking through them. 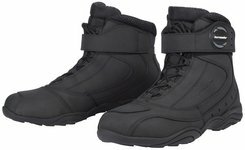 I hope to be able to provide an update to this blog about Mens Waterproof Motorcycle Boots on a yearly basis, so be sure to check back occasionally to see whats new in this genre of motorcycle performance equipment. Thank you for taking the time to read my thoughts and would love to hear back on any tips that you have in the quest for new boots. Are there things that I am overlooking? Any new ideas for persons with unique foot and calf issues? May you keep the shiny side up and the rubber side down. And may that smile be ever present, and may the bugs you get in your teeth taste good.